Our club was established in 1926. 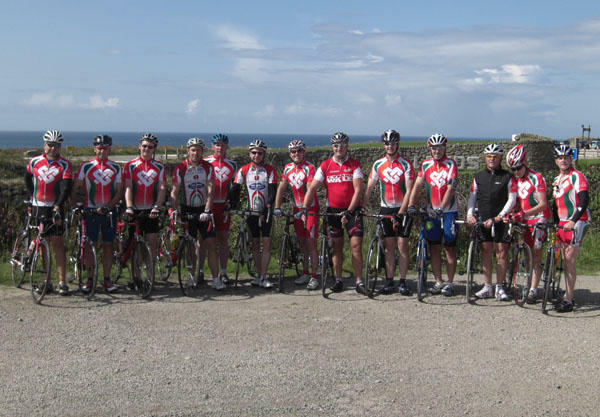 It has grown to have over 100 members and to be one of the strongest and most successful cycling clubs in Wales. The Port Talbot Wheelers organise a variety of open races and time trials during the year. The foremost of these is the weekly time trial which takes place on Thursday evenings at Resolven during the summer months. For details and dates on training and club runs see the Training and clubruns page. For those thinking about joining us please see our beginners guide which gives all the information you need to know. How long has the club been around for? The Club was established 93 years ago. We have riders from preteen to 70 plus, so we have something for everyone. Under 18's will need consent from a parent or guardian. What are the advantages of becoming a member of Port Talbot Wheelers? If you are a member of a club, you will get much more from cycling. The frequency and variety of rides mean you do more cycling and as you do more, you get fitter. The cameraderie and friendships make the miles so much more enjoyable...and safer. You can take part in road-racing, time-trialling and other cycle events. Also, you can enjoy the regular social events. Do I have to have previous cycling experience? Ideally, yes. You should be able to ride a bike comfortably for a reasonable distance - perhaps you have been commuting or going out for longer weekend rides. If you come along to join us for Saturday or Sunday rides, you should be confident about riding at least 25 miles at an average speed of 13mph for the ramblers ride. For Saturday's softrider's bash, you should be confident (from experience) about riding more than 30 miles at any average of close to 15mph. For Sunday 'Club Runs', you should be capable of riding more than 50 miles at one go. Come along to the club meeting at Taibach Community Centre at 7:30pm on a friday and have a chat or join us on our Club Rides or Off-Road Rides and see for yourself what a friendly bunch of people we are! If I'm thinking about joining, can I join the club on a ride or two to see if I "fit in"? We actively encourage this and ask that any new riders come on 'try out' rides with us a few times so we can assess your ability. Take a look at the Club Regular Rides page for information. Please also read our Club Rules page as your safety and well-being is paramount. What if I don't want to take part in racing? We organise both weekend (social) rides and also racing events. However, you are under no obligation to take part in any racing if you don't want to - it's entirely up to you! How do I join Port Talbot Wheelers? The first step is to get in touch with us at the club meeting. You don't have to join the club to come along on a few rides and as above, you do have to come on a number of rides before applying. It's always best to see if you like club cycling first! Annual membership rates can be found on the membership form here. Subscriptions fall due on January 1st of the current year and shall be payable no later than March 31st. Members failing to renew their subscriptions before April 1st shall lose all rights to membership. New members may apply at any time during the year. Applications received from new members after October 1st shall be accepted at the current subscription rate but will hold good until December 31st of the following year.